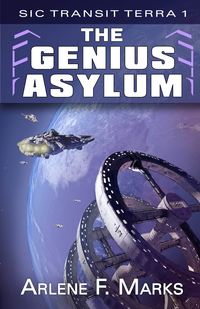 Fourteen years ago, Thryggian scientists permitted a mass escape of test subjects from their laboratory on Thrygg, including Abner Dedrick, the youngest member of the powerful Forrand-Dedrick family on Earth. These patients all thought they’d been receiving an unapproved longevity treatment. In fact, they’d been infected with a bio-engineered virus and their escape was the first step in a horrific experiment. Now the day of reckoning is approaching. The plague unleashed on the galaxy by the Thryggians has finally been brought under control and they’re on trial for this and other scientific crimes. The viral strain Abner was carrying has wiped out an entire Human colony. Only his young daughter Lania and his voice log – a damning piece of evidence if brought before the tribunal – have survived. Aboard the Earth ship that rescues Lania is Ixbeth Minegar, a lone alien who becomes convinced that Lania is part of a prophecy that could spell life or death for Ixbeth’s entire race. The Thryggians are not going down quietly. They’ve broken planetary confinement and are determined to find and eliminate any evidence against them, even if it means entering Earth space and destroying Earth ships. Fortunately, the one carrying Abner Dedrick’s log has an alien or two up its sleeve…. Born and raised in Toronto, Arlene F. Marks found her muse at the age of 6 and has been writing and sharing her stories ever since. Her work has appeared in H.P. Lovecraft’s Magazine of Horror and has been published by Daily Science Fiction. Her first science fantasy novel, The Accidental God, was nominated for the 2015 Stephen Leacock Medal for Humour. Arlene lives with her husband on Nottawasaga Bay but spends an inordinate amount of time in the Sic Transit Terra universe.